Anxiety – we have all felt this before. It can be mildly annoying or downright paralyzing. The underlying emotion behind anxiety is fear, though many people are not consciously aware of it. I think of Anxiety as “Fear without Focus”. It’s a general feeling of being unsettled, of not feeling confident or secure. One way to combat anxiety is to acknowledge and confront the fear behind it. Next time you feel anxious, say this statement to yourself, “I’m afraid that ….” You’ll be surprised at how many things come to mind. For instance, before a job interview – I’m afraid that I won’t get the job, I’m afraid they’ll ask me something and I won’t know what to say, I’m afraid I won’t make a good impression, I’m afraid of being rejected, etc. Try it the next time you feel anxious – it will help you identify the fear. 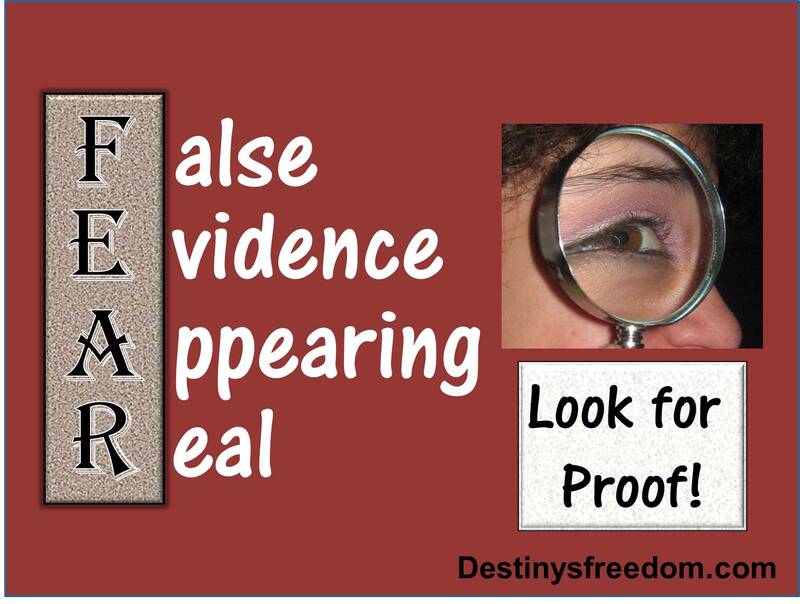 FEAR stands for False Evidence Appearing Real. Very often our fears are based on something that is not entirely true. Our mind jumps to the conclusion that something will go wrong so we become anxious. Once you have identified your fear, then look for proof. Very often you cannot prove that your fear will happen – in fact, most of what we worry about NEVER happens. It’s a waste of mental and emotional energy – it’s very distracting and it saps your creativity. Instead, turn the statements around and say the opposite of your fears. For instance, before a job interview – I might be offered this job, but if not, then it wasn’t the right job for me. The right job will come at the right time. If I don’t know what to say, I’ll take a minute to compose my thoughts. Something will come to me. I’ll make a good impression because I’ve prepared for this interview – I’m skilled and I can add value to this company. If I don’t get this job, it doesn’t mean I’m being rejected – it’s just business, it’s not personal. When you speak the TRUTH to your Fears, the anxiety literally vanishes! You can feel it drain from your body and your adrenalin reduces. Take a few deep breaths slowly and hold your breath while you count to 5. This increases the amount of oxygen in your system and your mind will begin to clear. When we get anxious, we tend to take shallow breaths which then makes our thinking a little foggy, which leads to more anxiety. Take a deep breath, speak the Truth to your Fears and watch Anxiety run away! By the way, it might feel like a battle the first time you try this. Our minds are used to jumping to negative conclusions. It takes some practice to learn how to slow down and speak the truth to yourself. Practice every time you feel a little anxious. It will really help when you need it most – I promise! It gets easier – your brain learns to do this process almost automatically after a while. Thanks, Terry. 🙂 I hope you’ll remember them the next time you are faced with fear.